Satellite communication generally involves three types of nodes: the ground station (also known as teleport), the satellite in geosynchronous orbit, and the satellite receiver/transceiver. I am interested in knowing how much a signal leaks into space during the ground-space-ground communication process. 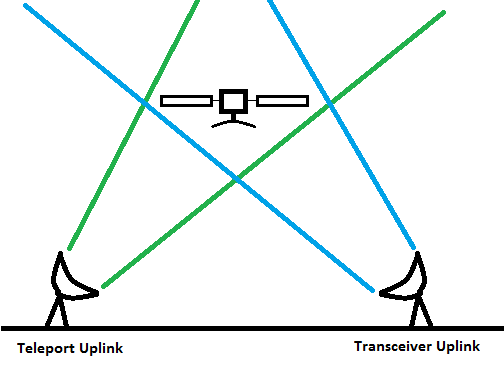 The following images are two possible scenarios which I drew to help illustrate the path for a signal uplink, and I'm unsure which scenario is more accurate. Possible Scenario One: The satellite uplink maintains it's path/signal width into geosynchronous orbit. Either little, or none of the signal leaks into space. 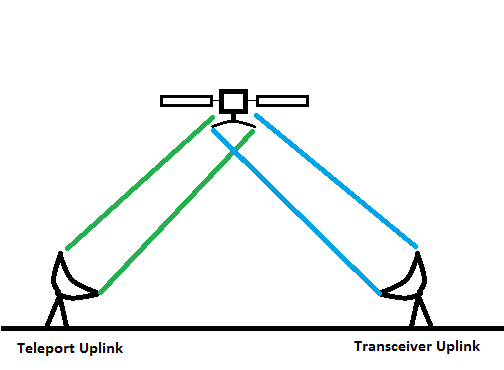 Possible Scenario Two: The signal of the satellite uplink spreads from the source of the uplink, similar to the path of a light of a flashlight. As a result, this spread results in much of the signal leaking into space. Which of these scenarios seems to be more accurate? Does the type of satellite uplink affect how much a signal spreads? (Ku-band, Ka-band, S-band?) Is a standard household satellite internet transceiver uplink more likely to leak then a teleport uplink due to the dish design? Another note to consider, I discovered while doing some Google-fu that satellite signal uplink also consists of "lobes". The main lobe has the strength to travel into geosynchronus orbit, but I'm unsure if the side lobes are capable of leaking into space. The above points are things to consider with satellite uplink leaking into space, but I am also curious if satellite downlink can also leak. As a final note, the following is a diagram showing the main lobe from a satellite leaking during the downlink process. 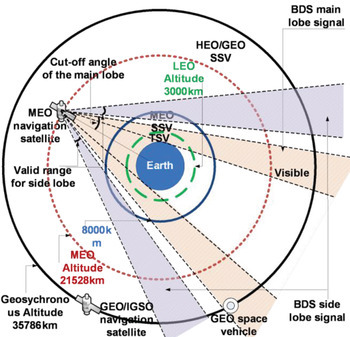 I am unsure if the diagrammed scenario happens universally with all geosynchronous satellites, or only with the one listed in the image source. They have to spread their signal. Also, it requires a really big dish to not spread your signal at all. Imagine that there was no spreading at all. The dish would have to be pointed exactly at the satellite, to the margin of the size of the dish. That is far beyond the technology of today! DSS has it's dishes pointed to 0.1 degrees. At the distance of Geosynchronous orbit, that is 62 km. Lasers can be pointed a bit more precisely, but still aren't that accurate. The amount that a signal spreads is inversely proportional to the size of the antenna (In most cases). There are calculators out there, but in general the higher the frequency and the larger the dish, the smaller the beam width is. But it cannot ever be pointed only in one direction without an infinitely large antenna. As an example, an antenna 10 m wide has a beam width of 0.14 degrees at 14 GHz (where I've taken the beam width as the -3 dB point). At 36,000 km (geostationary orbit), a beam sent by this antenna will be 88 km wide. For any reasonable antenna size, you will have leakage because the main lobe will be much wider than the receiving antenna. The sidelobes will be at a fairly large angle relative to the main lobe. For a dish, the sidelobes are a lot weaker than the main lobe, I suspect. 15 GHz -> wavelength ~ 0.0214 m, distance = 36*10^6 m and the transmitter = 10 m. 36*10^6*.0214/10 = 77*10^3. So my formula gives a rough approximation of Hobbes' result. Note that this is the lower limit; it's physically impossible to do better than this. In the real world, any practical system is going to do worse. For the downlink, this spread is going to be significantly smaller than the radius of the Earth as long as it's in the MHz range, so if it wouldn't violate quantum mechanics to have only a small portion of the beam miss the Earth, but again practical engineering is going to be another story. Also, if "downlink" is understood to mean satellite to Earth, then your last picture appears to be showing satellite to satellite transmissions, not downlinks. PS "receiver/transceiver" is redundant; "transceiver" already indicates this it is capable of being both a transmitter and receiver. Not the answer you're looking for? Browse other questions tagged artificial-satellite communication communication-satellite radio-communication geosynchronous or ask your own question. How can you calculate the minimal cone angle between two satellites to prevent interference?